September, slow month for fisherman strong month for the fish. Wow fishing was sure good, to bad so sad, few people showed up for it. Well anyhow the fisherman that went had some great Snook, Tarpon, and Redfish fishing. October is shaping up to be the same. Good news for October the anglers that are booking should get in on some of the finest fishing we have in this neck of the woods. September saw lots of redfish move in for the spawning session in the passes and some moved into the bays and oyster bars and flats throughout the area. Lots and lots of little one’s with some nice one’s thrown in. Snook are rampant in the passes and areas close to the passes. The only problem is the bait is so thick it was hard to get them to bite just one bait on a hook or one fly. Persistence paid off and we landed some nice fish. It was tough to stay calm watching 100 Snook at the time flip flop through the bait and wait for the strike. Tarpon were their also in and out of the passes and long the beaches near the passes. This is typical for this time of the year though. 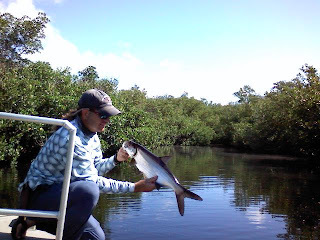 We also had some great Tarpon fishing for small one’s in the creeks from Naples to The Everglades seemed as if every creek had them somewhere you just had to be patient to catch them. They did not roll as much as they usually do so you had to wait sometimes 20 minutes for the right shot. Fished a fun tournament in September. Mixed bag tourney called Summer Doldrums. My anglers Oliver and Alex took home 1st in the Junior and Mens division. They did a great job catching 10 out of the 12 species of fish(picture). Great going for the two young boys 13 and 15. I am lucky to have them as anglers they are great fisherman. Like I said fishing was great and we caught fish inshore and offshore. Bass fished a couple times in September not worth mentioning. I would expect things to pick up next month. Fishing in October should be as good if not better then September. Tarpon are showing up in big numbers and will be feeding on flies and mullet in the passes and along the beaches. Bait will still be everywhere although it should be a little less so the fish might be more apt to take a hooked bait. Passes, beaches and bays near the passes will be holding everything in October. Night fishing will be awesome and expect to start catching slams under the lights including Snook, Redfish, Tarpon, and Trout. Accomplished this the other night in Capri, fished for 3 out of 4 hours caught so many my angler wanted to go in early and rest his arm. Wore them out in Marco River. I love this time of the year. Red Snook Tourney coming up this weekend. Conservancy puts this on with Roland Martin every year, should be lots of fun, believe there is still openings for it so try and fish for a good cause. Should be a fun tourney with some great fishing. Bass fishing in October should get better. Water temps will be decreasing along with rain which should get the bass going. Top waters early then go deep as the morning progresses. Well I hope everyone gets out and fishes. Nice to see the law enforcement out checking people. Hint though get in the boats and check them boxes. You cannot find illegal fish if you do not check for them. Good luck and good fishing. Roan z. Night Fishing this week will be the rule with a moon full. 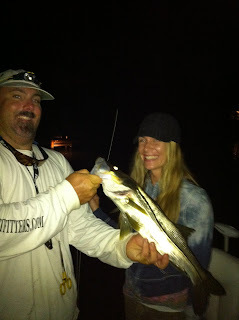 Pic of former Miss Wyoming catching her first Snook on Fly. Lucky Girl. Took Ritchie into the deep Everglades creeks with my specialty Tunnel Scandy White and found some nice Tarpon and Snook on the fly. Great Fishing for The last of August. Whether fishing Fly, Bait, or Plug we were catching everything inshore and offshore. Snook, Tarpon, Redfish, Kingfish, Cobia, and hordes of nice Snapper. Let us hope the summer keeps progressing and we do not have any severe storms to deal with and the fishing will continue to get stronger through September. Fish seemed to be everywhere in August as long as you went early or stayed late. Mid day fishing was tough. Everything after ten in the morning was a little hot and difficult unless you were fishing the docks or the deep Mangroves. 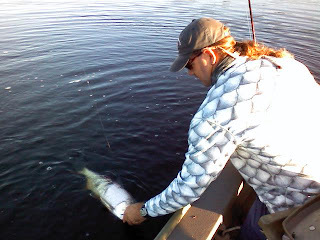 Morning and evening popper fishing was excellent for Snook and Tarpon in the canals of Port Royal and around the docks in Marco and Capri. Of course the night fishing was off the hook. As of late the Redfish are returning and are showing in the lights as well. 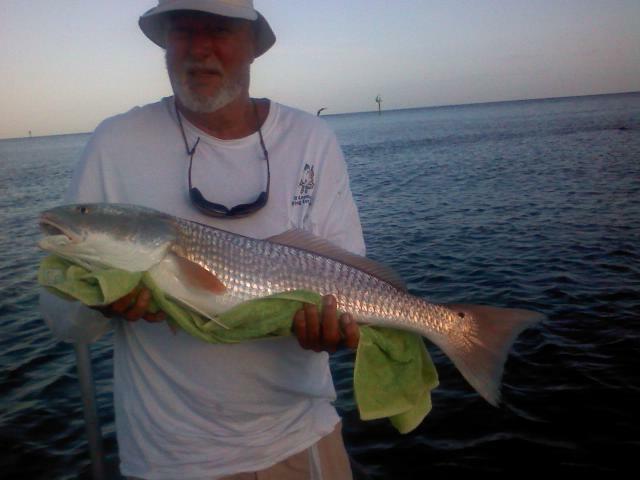 Last week of August has seen a large increase in Redfish catches. Two days ago fishing the pass with Jigs we landed three big fish from 30 to 35 inches shown in picture. Tough fight on the light spinning rod but my angler DzF. Did well. Offshore fishing in august was very good also. Lots and lots of snapper everywhere, actually they became a nuisance when grouper fishing. What a great nuisance. We have also been catching lots of mackerel, king and Spanish out there. Inshore bait fishing has been very good also. 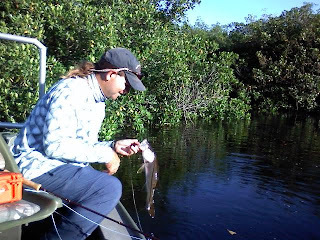 Bait has been small but plentiful and if you can find a few bigger ones the Snook have been tearing them up. Hint instead of the marker check the front of keywaydin and look for the larger baits. They are there you just have to look for them around the small baits. September fishing looks like it is going to be awesome. We will have to see what is going to be happen in the storms. 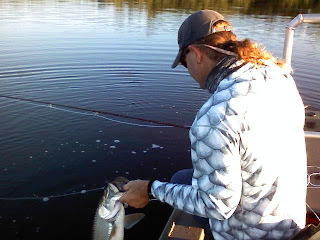 Redfish are right on track start looking for them in the passes and the bays close to the passes. They we also be on the outside beaches and jetties. Snook we continue to feed strong and get better if the weather cools a little. 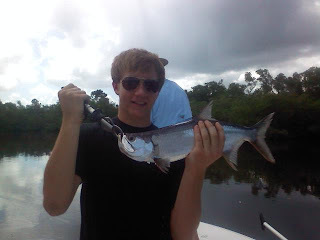 Tarpon should be plentiful and some big ones will be starting to show back up along the coast and the beaches. Bait will still be plentiful and should be getting larger. 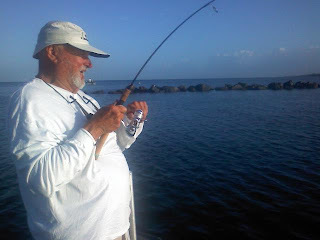 Expect offshore fishing to get stronger and fish from the north starting to return. The one great thing about September is the lack of people here so the locals have a chance to fish more. 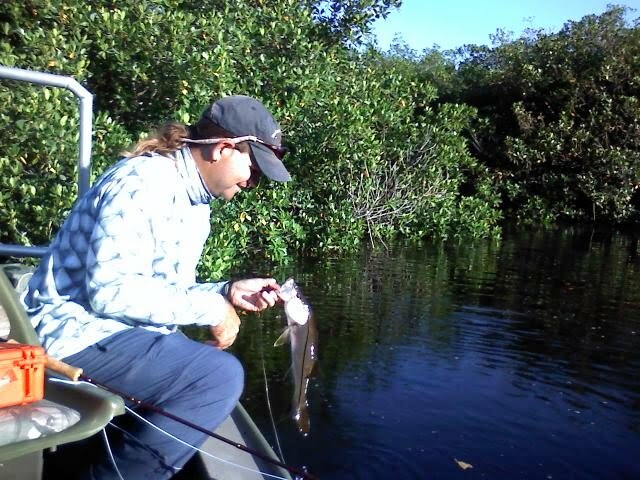 Now the bad news Snook season is still closed and will be at least through the 16th. Personally I am glad, there is too much poaching going on anyhow and I hope the law is taking this seriously and get there buts out of bed and start catching some of these guys. I am tired of seeing it going on and no one is out there working the problem. Maybe a change of working hours might be a good idea. The poachers seem to know when the law is not on the water. The other bad news is that Bay view park boat ramp will be closing starting the 13th of September through Dec. 31st. Just great!! Well It will be interesting changing my departure area for a lot of my trips. Well 951 is still a great place to fish out of. I have been and will be fishing a little more out of Port of the Islands. Good Tarpon fishing this time of the year. Oh yeah Bass fishing should get better toward the end of September. Good luck and Good Fishing Roan z.